Desmotabs 200 mcg 30 tabl. The active ingredient in Desmotabs is desmopressin acetate, a substance similar to antidiuretic hormone (ADH). This hormone regulates water balance in the body by controlling the level of fluid that is filtered out the blood. ADH deficiency causes excessive urination and extreme thirst. Desmotabs (desmopressin) restores the body’s water balance, which helps to relieve these symptoms. 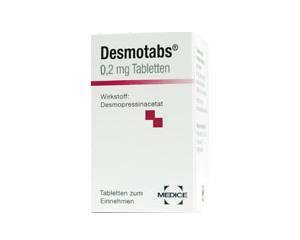 Desmotabs (desmopressin) is prescribed for nocturnal enuresis, bed-wetting at night, but it is also used to treat other conditions where the body’s water balance is impaired, including diabetes insipidus (‘water diabetes’) and certain diseases of the blood that cause coagulation problems, such as haemophilia A and Von Willebrand disease. If Desmotabs (desmopressin) is used for bed-wetting, it should be taken with some liquid before going to sleep. Desmotabs temporarily reduces urine production so you don’t have to urinate at night. If used to treat other conditions, your doctor will tell you how to take this medicine. The duration of the treatment is decided by the doctor. It is important not to exceed the prescribed dose. If you happen to miss a dose of Desmotabs (desmopressin), you can skip the missed dose and proceed to the upcoming dose. If you are taking Desmotabs (desmopressin) for a condition other than bed-wetting, you may take the missed dose unless it is almost time for your next scheduled dose. These side effects generally disappear when the patient becomes accustomed to the medicine. See package leaflet for more side effects, warnings and contraindications. Never use Desmotabs (desmopressin) without consulting a doctor if you are pregnant or planning to get pregnant. Desmotabs (desmopressin) is safe to use when breastfeeding. The use of Desmotabs (desmopressin) temporarily reduces urine production. It is therefore advisable to limit your fluid intake while taking this medicine. Only drink when you are thirsty until eight hours after each dose. After the effect of Desmotabs has worn off, you can resume your normal drinking habits. With Desmotabs (desmopressin) there are no food or alcohol restrictions. This medicine does not affect your ability to drive.